34/38 Eversholt St, Kings Cross, London NW1 1DA. OPEN EVERY DAY from 9:30 pm to 6 am. WHEN? From Monday 11 February. We are very excited about the new venue and can’t wait for everyone to see it! MEANTIME, GET READY TO CELEBRATE THE CARNIVAL PARTY OF THE YEAR. 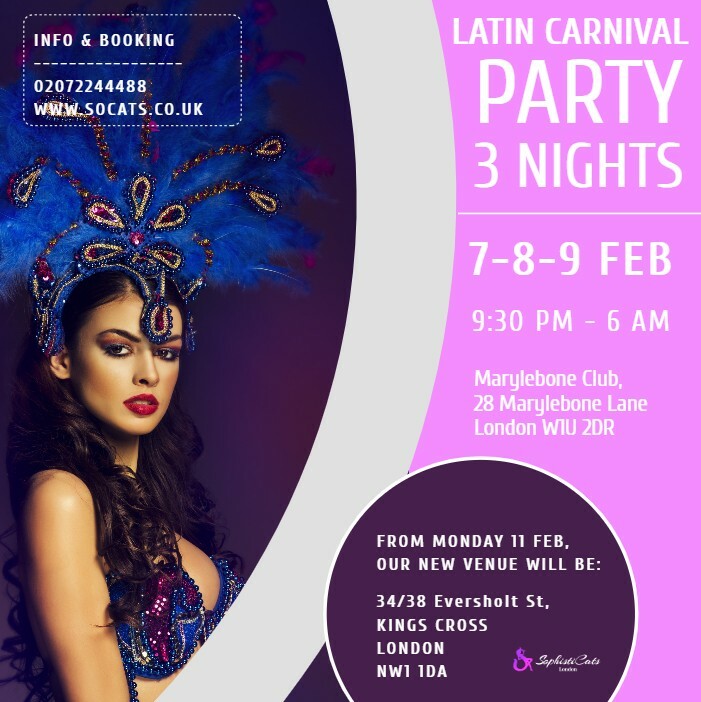 3 EXCITING COLORFUL NIGHTS featuring beautiful girls dressed in Samba Costume, Latin rhythms, plus a Percussionist doing a special set. To reserve a Table or VIP booth please contact us on 020 7224 4488. THESE ARE DEFINITELY 3 NIGHTS NOT TO MISS!